Golden State Warriors star Kevin Durant joined his team’s lengthening injury list on Friday and will miss the NBA champions game against Sacramento with sore ribs. Durant ranks sixth among all NBA scorers this season with 26.6 points a game, just ahead of teammate Stephen Curry, and also averages 6.8 rebounds, 5.4 assists and 1.9 blocked shots a contest for the Warriors. Golden State will also play host to the Kings without Curry, who will be re-evaluated Monday for a sore right ankle, and backcourt partner Klay Thompson, who will be sidelined until at least Wednesday with a fractured right thumb. At 52-16, the Warriors have the second-best record in the NBA, trailing only Houston (54-14) as they work toward a third playoff crown in four seasons. Golden State has clinched a fourth consecutive Pacific Division title for the first time in club history. Warriors coach Steve Kerr joined Pat Riley as the only coaches to win divisional crowns in their first four seasons as an NBA head coach. 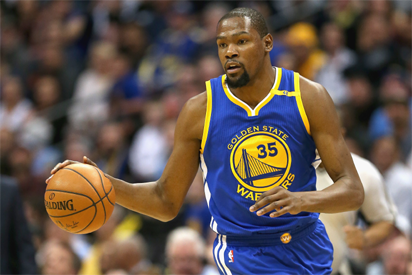 The post NBA: Durant joins absent Warriors stars with sore ribs appeared first on Vanguard News.